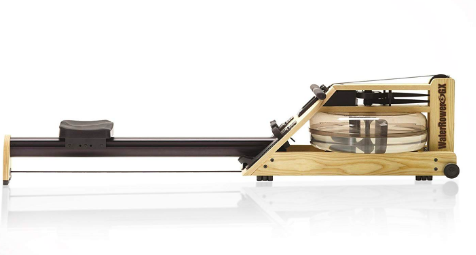 Handcrafted rowing machine with "water flywheel"
The WaterRower Club Rowing Machine is a classically designed water rowing machine that‘s made to look great and help get you in great shape at the same time. A smooth rowing experience combines with a powerful fitness monitor and the ability to easily store this rower on end to form a rower that’s just as home at your living as it is on a workout floor. They’re not much like actual rowing. While the movements are very similar, there’s not a whole lot of water involved with most rowing machines. Unless you’re working with a water rowing machine. Water rowing machines use water for resistance rather than air, magnets, or a hydraulic piston. Instead of the choppy movements often associated with other types of rowers, water rowers move smoothly as the rowing handle comes back and forth. If you’re in the market for a water rowing machine, keep reading for an in-depth look at some of the best choices on the market. If you really want to get the most out of your workout time, a rowing machine is a great way to do it. Hitting just about every major muscle group and giving you a solid dose of low impact cardio, rowers provide a lot of value. Water rowing machines provide the same great workout as other rowing machines, but with a smooth, natural motion. What’s the Best Type of Resistance? Before choosing a water rower, it’s important to take a look at your fitness needs. 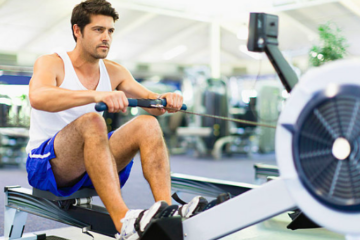 Whether your goal is to get in better shape, lose a few pounds, or just get some extra cardio in a rowing machine is a powerful tool. While all rowing machines provide similar workouts–relative to their quality of course–not all do it in quite the same way as water rowers. 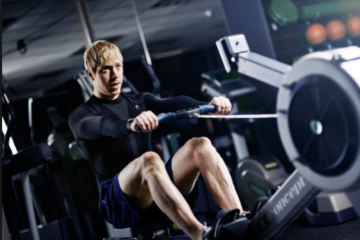 Where air or hydraulic piston rowing machines can feel choppy at times as the tension transitions from one direction to the other, water rowers provide the same firm, constant resistance that only water can provide. Most water rowers use a water tank with several paddles inside to generate resistance. When you pull the handle, the paddles spin and push against the water. The faster you row, the harder the paddles begin to turn. When shopping for water rowers it’s important to consider how much space you have. Most water rowers are not designed to fold up or be taken apart for storage. Many can be stored vertically on end though. Water rowing machines are typically higher-end pieces of fitness equipment. While more inexpensive units can be found, most are priced upwards of $600. But, with water rowers, you really do get what you pay for. Many water rowing machines have beautiful wood frames and are made for many years of use. For a truly authentic rowing experience, nothing beats the original. Handcrafted in the USA, WaterRower is one of the oldest and most well known names in water rowing machines. The WaterRower Club Rowing Machine uses a water resistance method that is at once quiet and smooth, giving users a truly unique workout. A tank at the front of the machine holds the water, while a set of paddles spin in the tank when rowing. Though there’s no adjustability, resistance naturally increases with the speed of the rower. The frame of Club rowing machine is made almost entirely of wood, which reduces vibration and increases the smooth operation of the machine. A built-in fitness monitor tracks strokes, heart rate, and more. The Stamina 1445 Wave Water Rowing Machine gives users an authentic rowing experience with real water resistance. As you row, a series of paddles turn inside a water tank, providing a limitless stream of resistance that grows with difficulty the faster you row. The steel frame of the Wave is fitted with wheels at one end for easy transport and can quickly be folded for storage in smaller areas. A padded seat and rowing handle provide comfort and a better grip while rowing. The Stamina 1445 Wave Water also includes a built-in fitness monitor that allows users to track important stats like distance, time, stroke count, and others. The Sunny Health & Fitness Water Rowing Machine is one of the most affordable water rowers out there. A metal frame provides good support and long term durability, while rubber padding keeps the machine in place on hard surfaces and ensures that it won’t damage floors. Wheels are fixed to one end so this rower can be easily moved when needed and stored in a vertical, upright position. A built in LCD fitness monitor tracks distance, time, strokes, and other key statistics while you row. Resistance comes from a water tank fitted with three paddles. The First Degree Fitness Newport AR Rower is another metal frame rower that’s built with durability and long term use in mind. This rower provides smooth, quiet power with a belt drive that produces little extra sound beyond the swirling of the water tank. The built-in fitness monitor tracks stats like distance and time. One advantage of the Newport is the ergonomically designed handle. The angled grips help reduce wrist strain, allowing users to row longer with less fatigue. 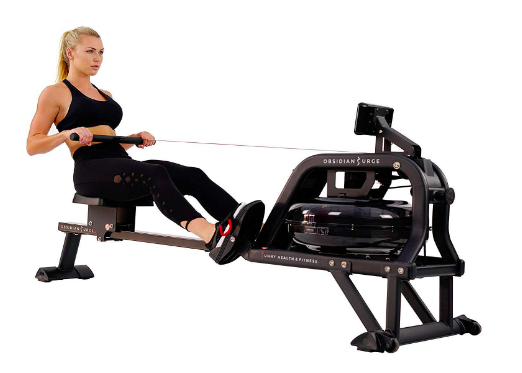 Resistance can actually be increased on this rower with a simple turn of a dial located on the top of the water tank. Baffles with the tank help ensure that water pressure is consistent and constant. A true “classic” from WaterRower, the Classic has a real, handcrafted wood frame and a low to the ground profile that keeps this rowing machine lighter and more compact. 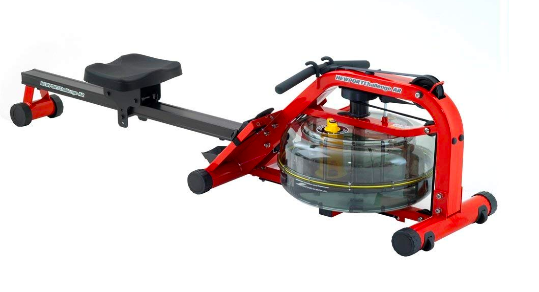 This rowing machine takes advantage of a truly all water rowing experience that places the flywheel in a separate tank of water to keep the entire process smooth and fluid. This also keep the parts clean and lubricated for longer life. The included Series 4 fitness tracker can also be used to store and track workout information like time, distance, stroke, and more. Even your heart rate can be monitored while you row. The First Degree Fitness Viking 2 AR Home Fluid Machine is another wood framed water rower that’s designed with a premium rowing experience in mind. American Ash wood and dark metal accents combine to give this machine a classic look. Unlike many other water rowing machines, the Viking 2 also sports an adjustable resistance feature. Rather than simply rowing harder, users can turn a dial and increase the tension. A belt drive system helps keep this unit smooth and quiet. Although they do not articulate while rowing, the foot plates are adjustable for height–making for a more comfortable experience. An ergonomically designed handle also improves comfort by reducing wrist strain. The WaterRower GX is another quality rowing machine from WaterRower. Rather than being made entirely of wood, the GX uses aluminum for the rail. This not only reduces the overall weight and maneuverability of this machine, but also the cost. In addition to fluid, belt driven water resistance, the GX has a multi-function fitness monitor that’s capable of tracking time, distance, stroke rate, and other important metrics. The maximum user weight of this rowing machine is a generous 300 pounds and a one year manufacturer’s warranty protects this machine for home use. 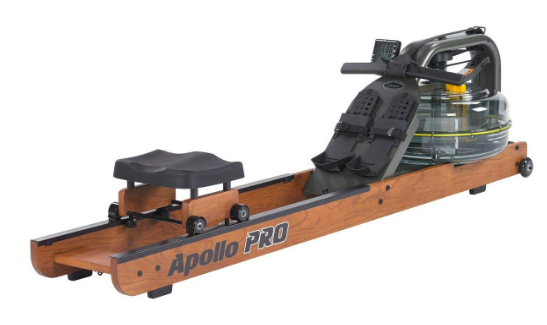 The First Degree Fitness Apollo Pro II Rowing Machine is a high quality, commercial grade water rowing machine that’s made for lots of use. The Apollo Pro II uses a three bladed turbine within the water tank to generate strong, consistent tension. Users can also select from four different levels of resistance, making this machine versatile enough for a variety of users. A multi-function fitness monitor helps users track progress by monitoring time, distance, stroke count, and more. Like other First Degree rowers, this machine’s water tank is fitted with a series of baffles to help eliminate dead spots in the rowing stroke. The WaterRower M1 HiRise Rowing Machine is a serious water rower for serious use. Designed for commercial use, the tubular, powder coated steel frame is designed to be at home in the gym or at home. The M1 is taller than many water rowing machines, sitting high off the ground on its long legs. A high seat places users in a position that’s comfortably away from the floor. The included fitness monitor tracks workout intensity, stroke rate, heart rate, and more. Despite its hefty 200 pound weight, the M1 does have a set of wheels built in for easy movement and can be stored out of the way on its end. The Pure Design Fitness Indoor Rowing Machine is another home use water rowing machine that’s designed with durability in mind. This simple, lightweight rower has a minimal wood and steel frame that’s made to be rolled out of the way when necessary with the built in wheels. It can also be stored on end when not in use. The built in VR2 fitness monitor can quickly track the user’s progress while rowing, making it easy to monitor intensity, distance, time, and other things. 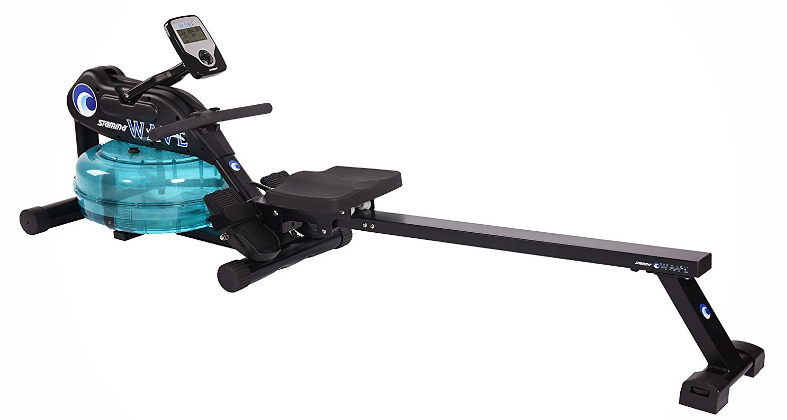 This rower can accommodate users up to 325 pounds and with a 36 inch inseam. Picking the right water rowing machine can be a challenge. There’s plenty of options and some truly high quality choices. But, if you’ve got to pick just one, it’s tough to go wrong with the WaterRower Club Rowing Machine. The WaterRower Club has classic lines and a nice, smooth rowing action. WaterRower’s belt design and the wet flywheel feature help set this rower apart from much of the competition. The ability to easily wheel this rowing machine out of the way and store it vertically really rounds out the package. Before you decide on a rowing machine, be sure to check out the WaterRower Club Rowing Machine.